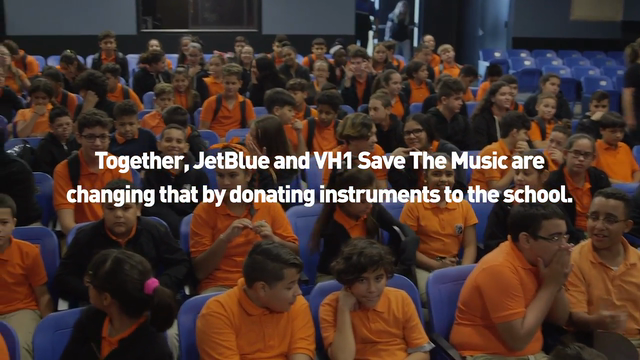 Last month, JetBlue worked with VH1’s Save the Music to donate instruments to Henry H. Filer Middle Schoo in Hialeah, Fla. to “bring the beat back.” The donation will help revival their music program, which had been shut down for more than a decade. JetBlue recognizes how much music adds into a child’s education. The arts help inspire creative thinking and opportunities. The event ended on a high note with a surprise guest performance from Emily Estefan. JetBlue For Good - Giving back is part of JetBlue’s DNA and is core to its mission of inspiring humanity. Centered around volunteerism and service, JetBlue For Good focuses on the areas that are most important to the airline’s customers and crewmembers - community, youth/education and the environment. Combining JetBlue’s corporate efforts with its customers’ and crewmembers’ passions, the common theme is Good – JetBlue For Good. Join the #JetBlueForGood conversation on Twitter, Instagram and Facebook, check for regular updates and get involved.